Do you drive a late-model car, van, or light-duty truck that uses a transponder key? Are you wondering where to get a car key made when you need a new high-security car key like a chipped key? At Quality Key Locksmithing in Wichita, KS, we offer fast transponder key programming at a price that’s more affordable than you might expect. We’re your local, full-service mobile locksmith company, and we have the specialized equipment and expertise that’s needed to provide you with on-site laser key cutting, chip key programming, and transponder key programming. A transponder key is a type of automotive key that has a radio-frequency, or RF, transmitter chip embedded inside the key head. Vehicles that use transponder keys have a small RF receiver connected to the ignition system. 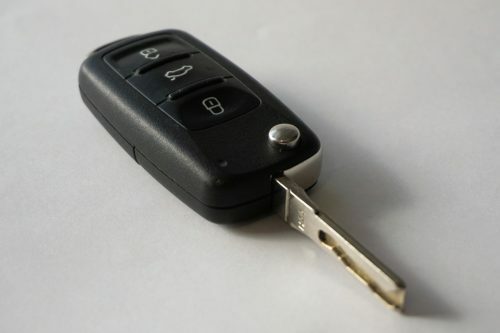 When the chipped key is placed in the ignition, the vehicle detects the key and confirms that the signals on both the key and the receiver match, allowing the ignition to be turned over to start the engine. Transponder keys became common on both domestic and imported vehicles as of the early 1990s, and these chipped keys are a part of the factory anti-theft system on almost all cars on the road today. Depending on the make, model, and age of your vehicle, your transponder key will use either a simple resistor-based system to determine if the correct key has been inserted into the ignition, while newer models make use of a complex rolling encrypted code that involves a two-way transmission between your chipped key and the receiver in your car. Here at Quality Key Locksmithing, we have the equipment and expertise it takes to duplicate any type of chipped key. Transponder key programming for some vehicles such as older Fords and Chevys can be done using a relatively simple on-board programming procedure, while other makes require the use of a computerized tool that must be connected to your vehicle’s computer to be encrypted. Regardless of what type of high-security car key you need to be made, you can rest assured that we’ll provide you with an accurate, OEM-quality key that’s guaranteed to work flawlessly in your vehicle. Don’t take chances when it comes to car key cutting – call us here at Quality Key Locksmithing when you’re wondering where to get a car key made in Wichita. Our licensed, registered, and fully insured mobile locksmith will come to you, saving you the time, cost, and hassle of purchasing a new chipped key from your local automobile dealership.